Housing on Merit distributed Christmas gifts to children residing at two of our San Diego properties, thanks to our longstanding partnership with the San Diego U.S. Marine Corps Reserve Toys for Tots Program. We received more than 120 gifts from Toys for Tots, and a group of volunteers wrapped all of the gifts in preparation for our annual Holiday Celebration. 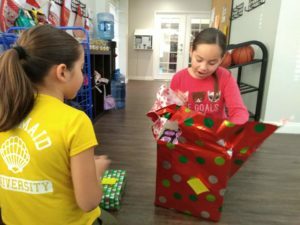 Young participants at our Rio Vista and Vista La Rosa communities each received two gifts and enjoyed numerous activities such as a cookie decorating contest, a Christmas mad libs game and musical chairs.